In a previous post about self care I’ve mentioned how I love candles and wax melts. They are little luxury items that I buy for myself. I love the cute wax warmers, all the neat wax shapes and how they make my house smell great. 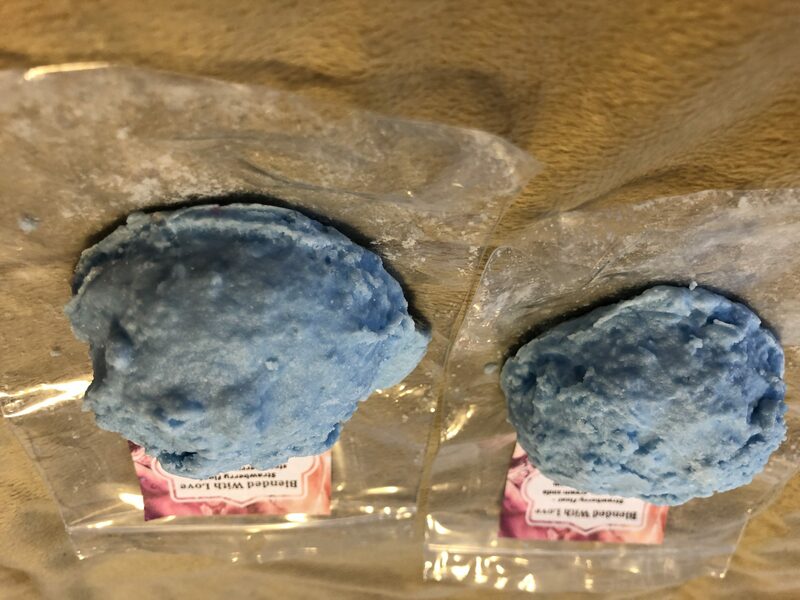 The only problem I had was that most of the store bought scents gave me a headache, so a couple of years ago, I was browsing Etsy for homemade wax melts. I found this small shop that made the cutest cupcake melts. 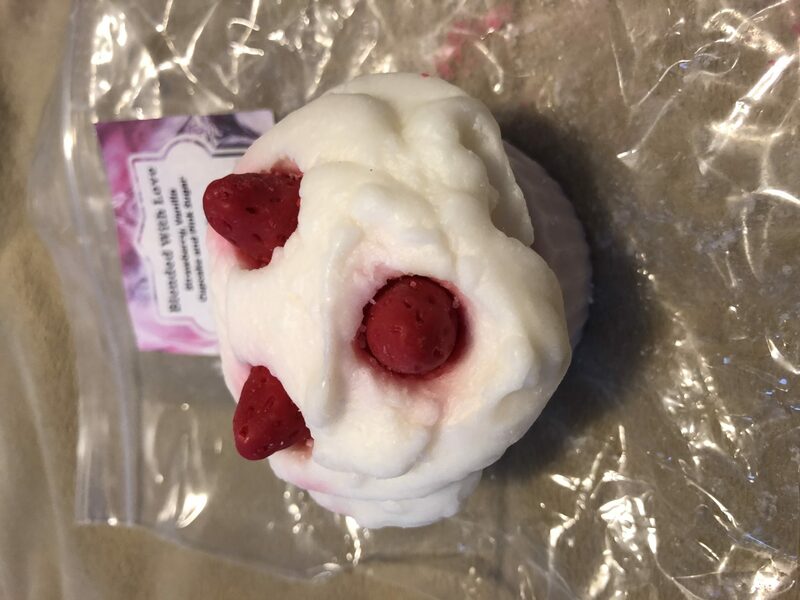 I love anything cupcake, so I bookmarked it and a few weeks later, I placed my first order. 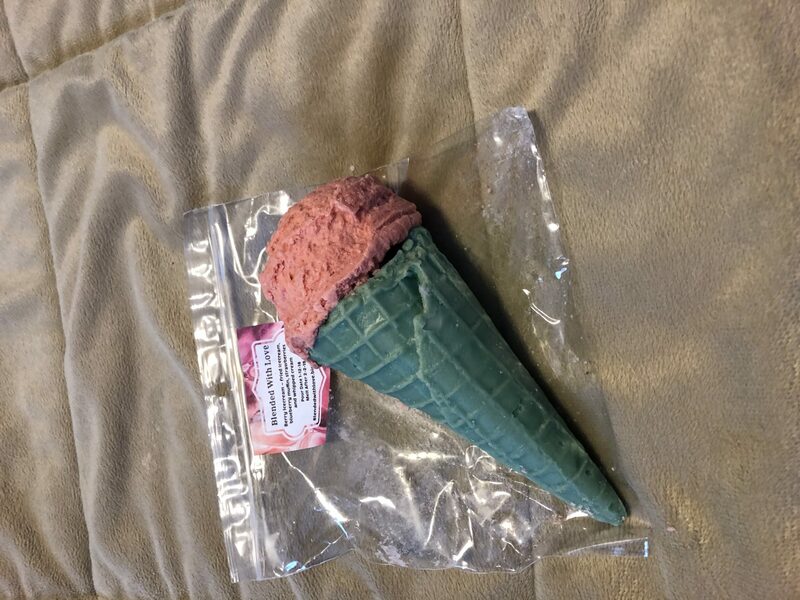 I don’t have pictures of my first order, but I remember a heart shaped cupcake, some strawberries and cream wax brittle and a black raspberry vanilla cupcake. Since then, I’ve been addicted, placing orders every few months. Here’s what I love about Blended With Love. First, the owner, Ashley is a work at home mom and I like to support other moms who have a small business when I can. I hope to have a business of my own while being with my child, so I feel supporting other moms on the same mission is a way to pay it forward. Whenever I’ve had a question, Ashley answers promptly and is always friendly. She posts updates regularly in her Facebook group. 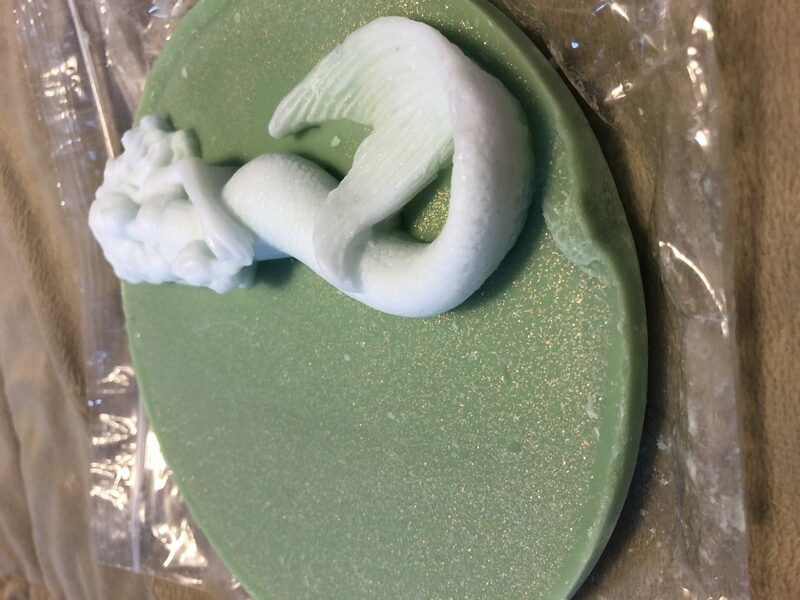 She shows us new melts she’s working on, beautiful wax creations and of course, there are giveaways. If there’s a problem with your order, she does her best to fix it. There was a mix up with one of my orders and she quickly sent a refund. The best part is the wax melts. The Shop is restocked at different times. There was a restock last month and the next one is on February 2nd. To get specific information on restocks, check the Facebook group. 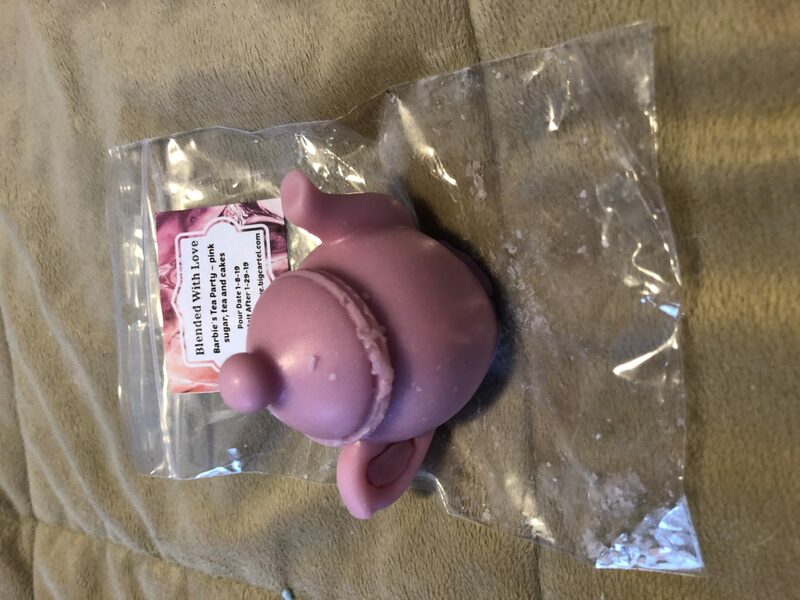 Blended With Love offers a variety of wax melts depending on the season or requests from customers. 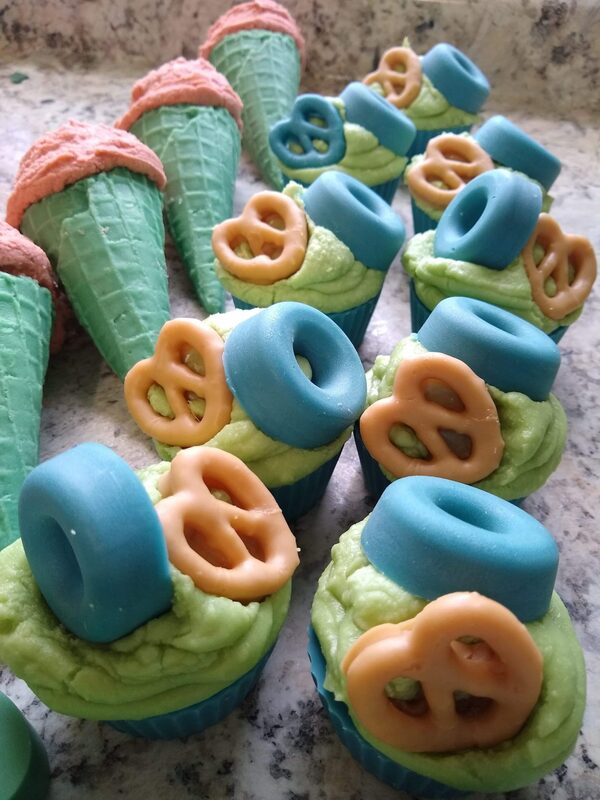 Some of the common melts include owls, penguins, cupcakes, donuts, ice cream scoops, teacups, teapots, flower pots and drip cakes. There are a variety of scents to choose from. Most of them are unique blended creations. Ashley has a long list of people who are signed up for custom orders. Fortunately, I was recently able to place a custom order and I was impressed with everything I got. I ordered a variety of shapes. Some of them with a single scent and others with blended scents. 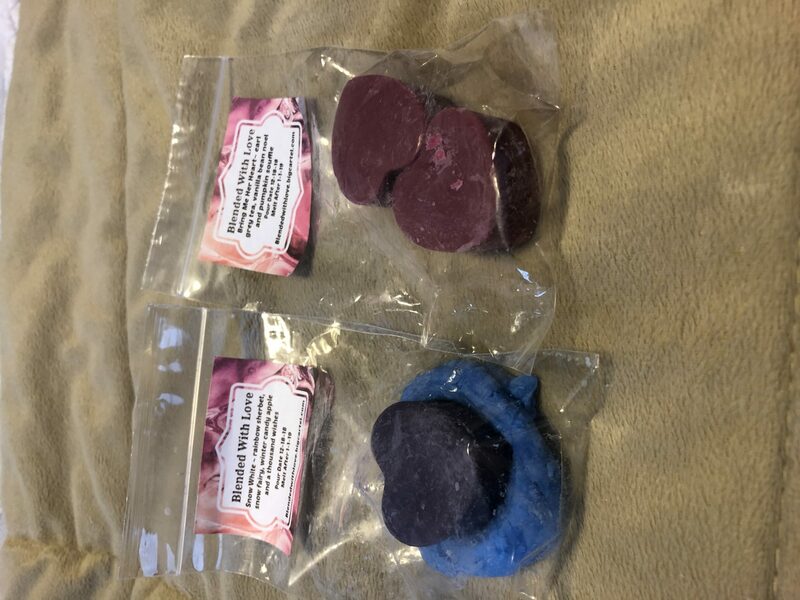 What I love about these wax melts is I can melt them many times before they lose their scent. 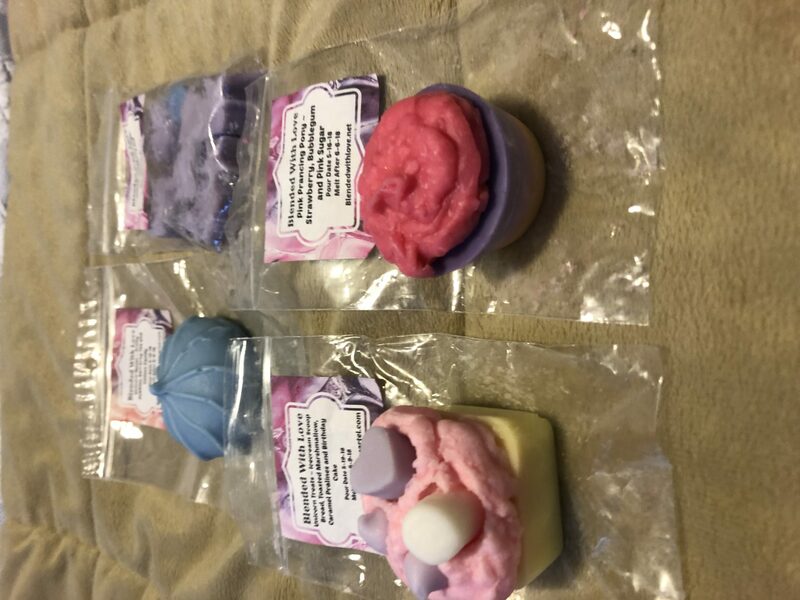 Many of the wax melts are large and have to be cut into pieces before melting, but that just means they last longer and I can enjoy the scent multiple times. I also love the little details. They are so pretty and look so much like actual baked goods, that I don’t want to melt them. They are works of art. Sometimes Ashley will create mystery boxes based on a theme. 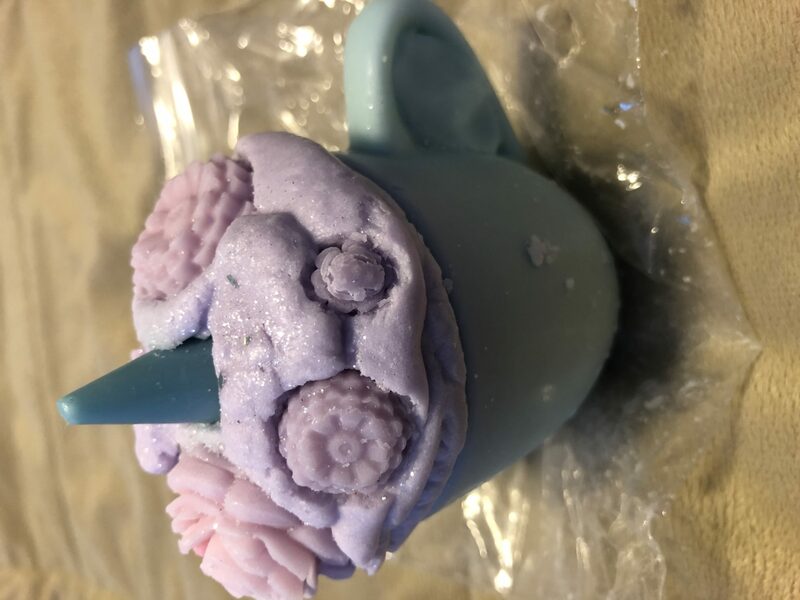 I love unicorns, so when she announced a unicorn mystery box, I had to get one. Most of these scents smell like candy and the little cakes are cute. 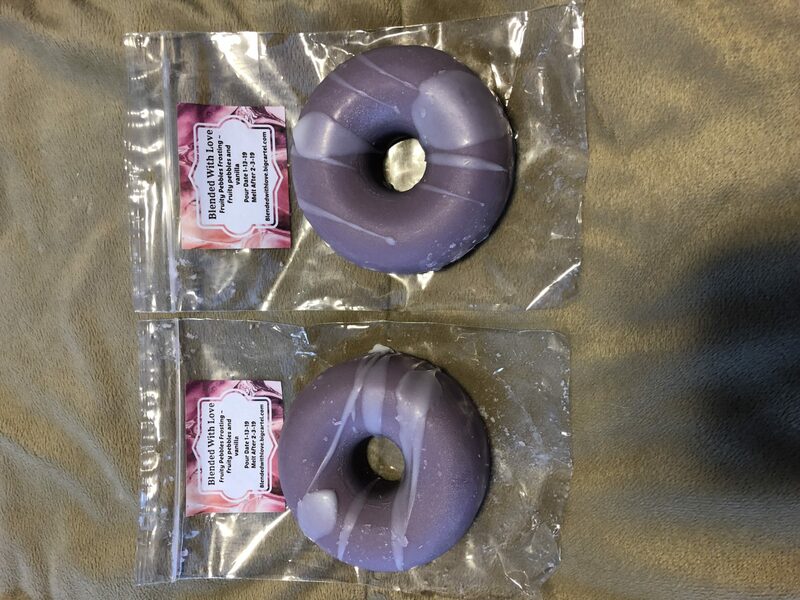 They are the perfect size for my wax warmers and I love the little unicorn shapes. She’s also done a Snow White mystery box. One of Ashley’s most recent additions are the crystal melts. There is another list of people who want crystal orders in the Facebook group. You get to choose your crystal, the shape you want and of course, the scent. 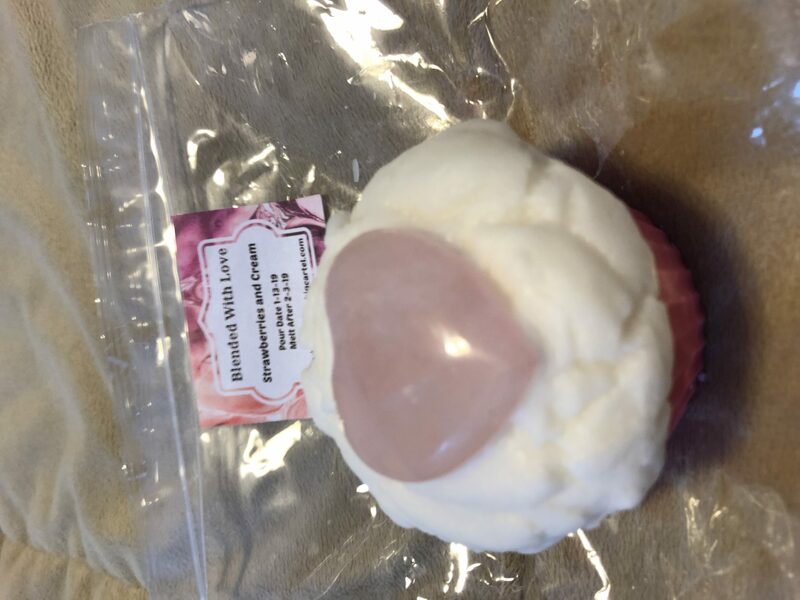 I chose a rose quartz heart with a strawberries and cream cupcake. 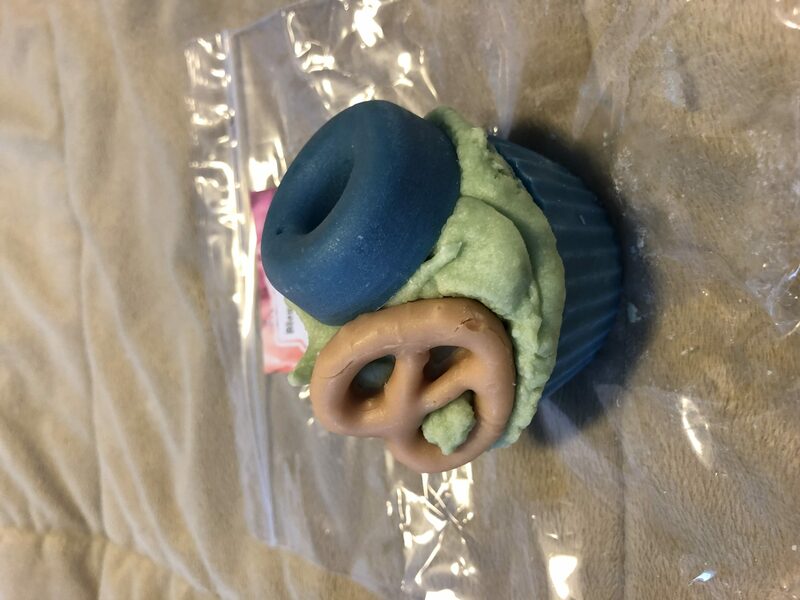 She’s combined three of my favorite things, crystals, cupcakes and things that smell good. I’m sure there is more yet to come. 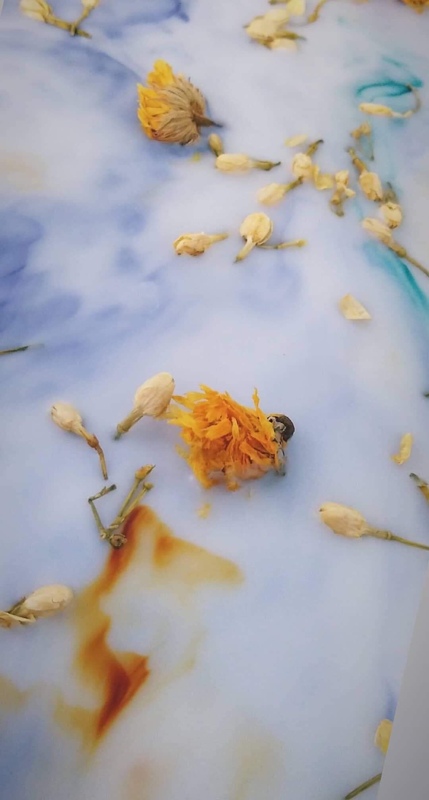 I can’t wait to see what else she creates and I hope you head on over to try some of her wax. You’ll love it! I have not been compensated in any way to do this review. I just love her products and want to support another mom doing amazing work. They are cute. It’s a shame to melt them. They are little works of art. It’s a good feeling supporting other mamas. Thank you for commenting. These are really cool. Thank you for sharing. I love that this post speaks about their service. The service is one of the most important things about a business. In some cases, the service is worth way more than the product. Since good customer service can be rare these days, I love to point out positive experiences when I can. Thank you for your comment. So cute! And very creative. Only problem is I want to eat them haha. I know… They do look yummy and realistic too. Thank you for your comment.